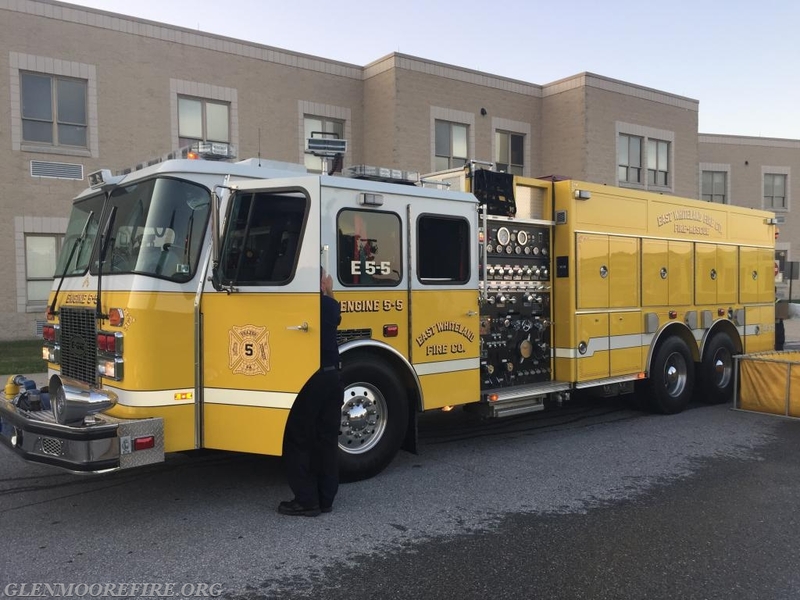 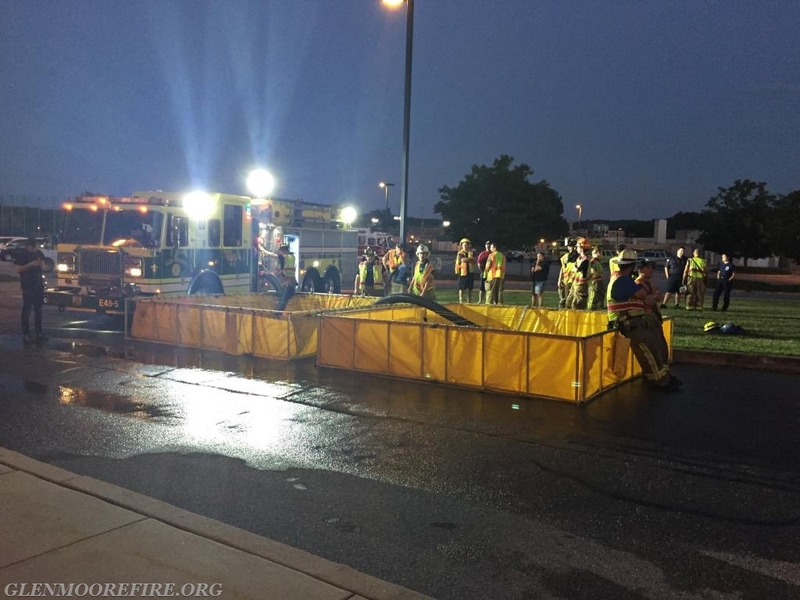 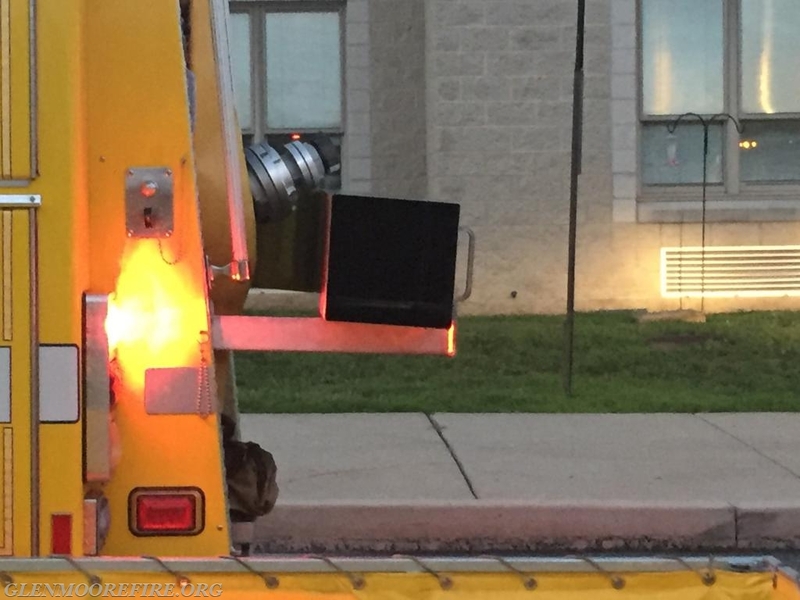 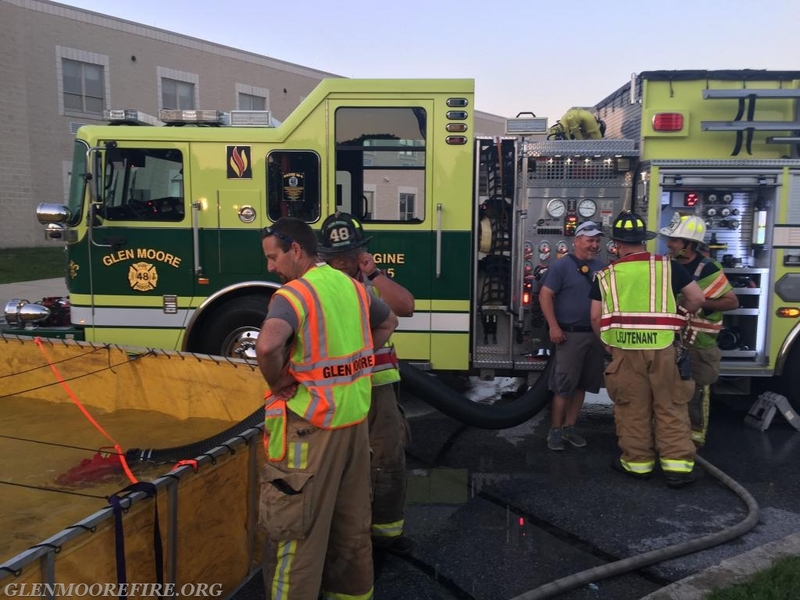 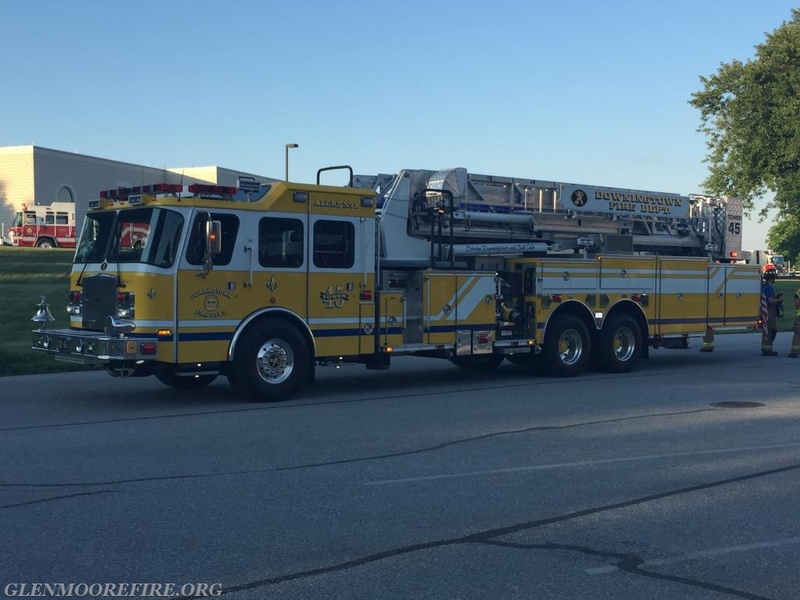 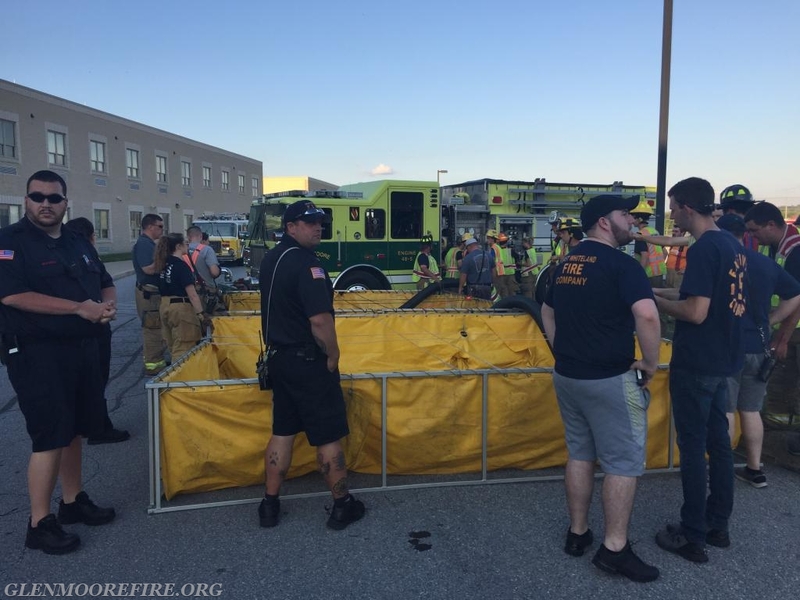 Last night for their weekly training, the volunteers from the Glen Moore Fire Company joined the members from the Downingtown Fire Department (Stations 45 & 46) for a water supply drill. 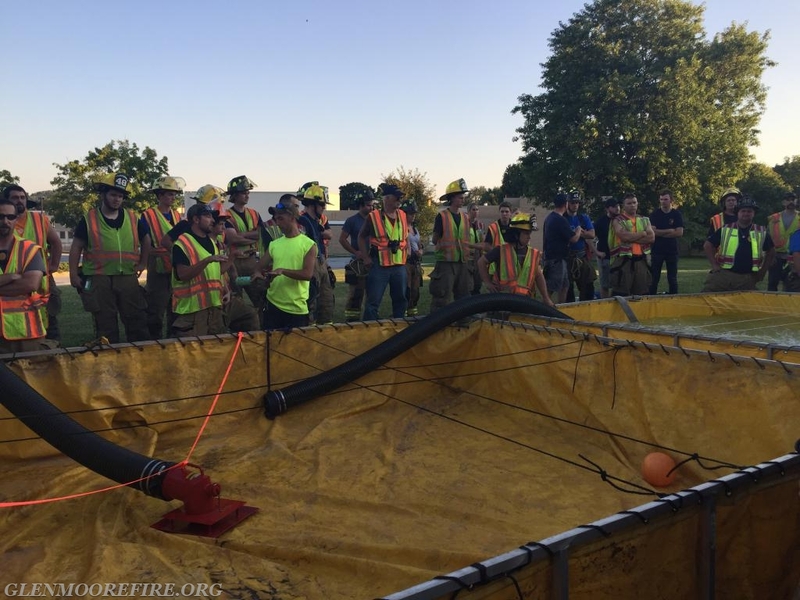 Over the past few weeks GMFC has been training on rural water supply and this drill was the culmination of those trainings. 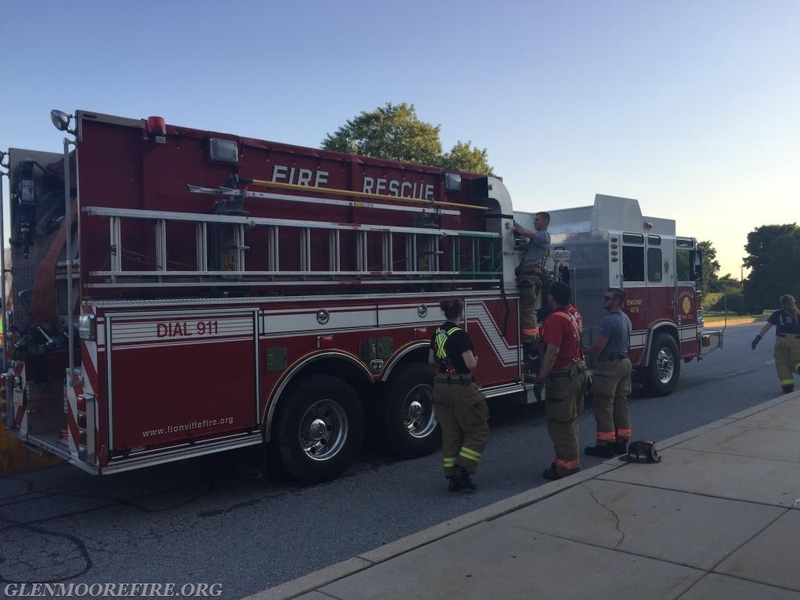 In the rural areas of Chester County that are served by GMFC there is limited access to fire hydrants. 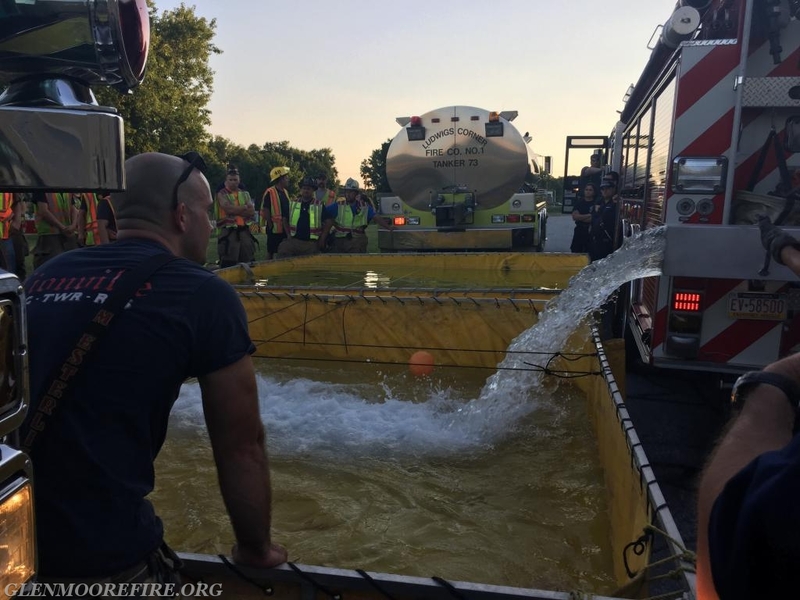 Therefore, using tankers and running a port-tank operation is one of the main ways of supplying water to the fire scene. 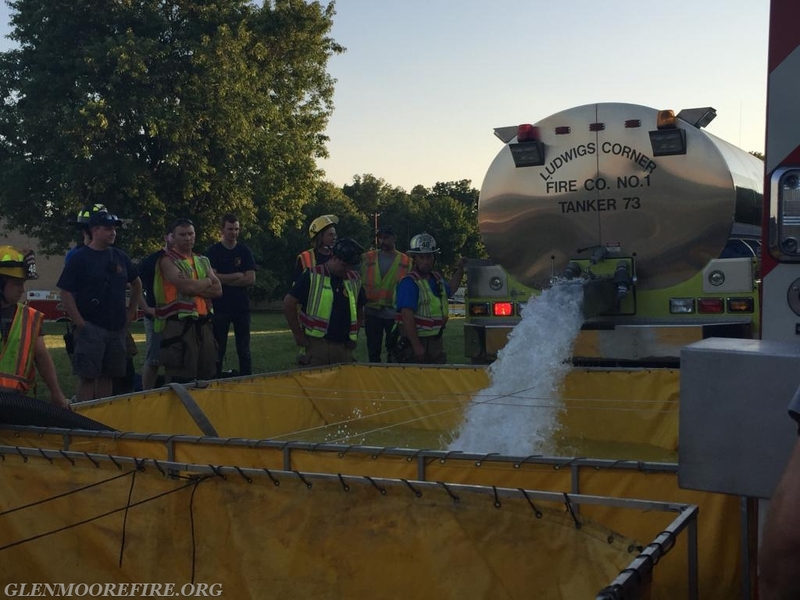 During this drill, two porta-tanks were set up for drafting. 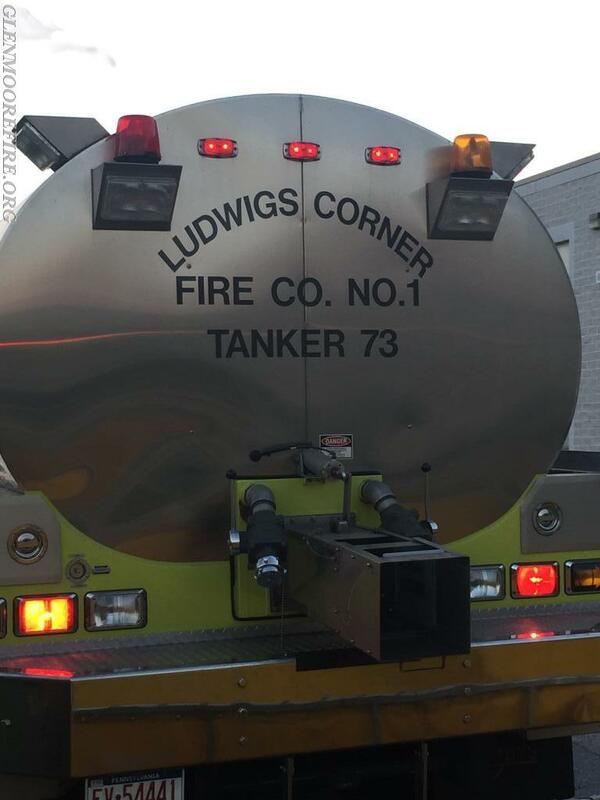 Engine 45 set up a tanker fill site at a nearby location. 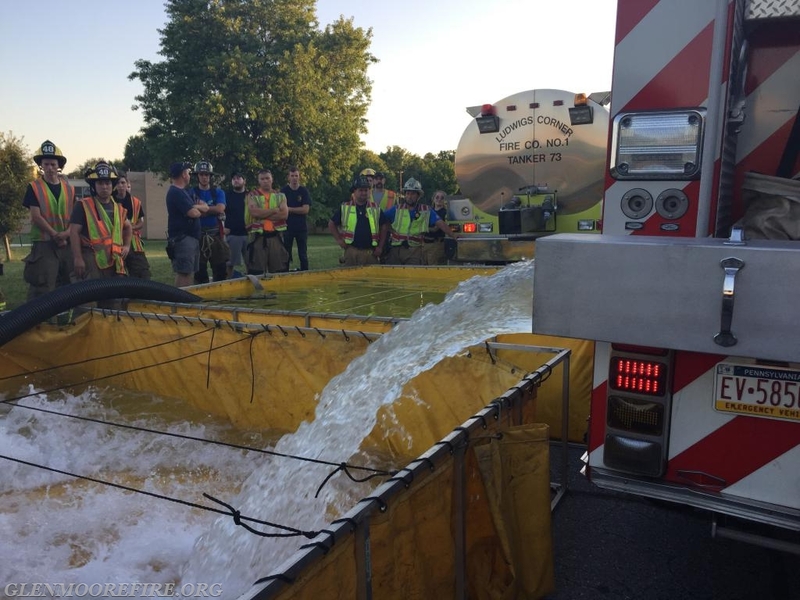 Tanker 73, Engine 47-5, and Engine 5-5 shuttled water to the porta-tanks. 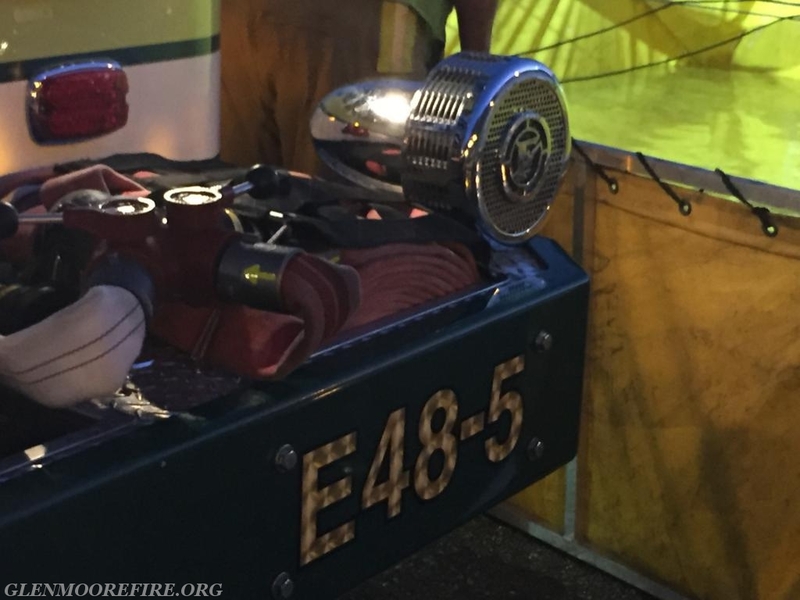 Engine 48-5 drafted from the tanks and supplied Engine 46-1 and Tower 45 who were flowing master streams. 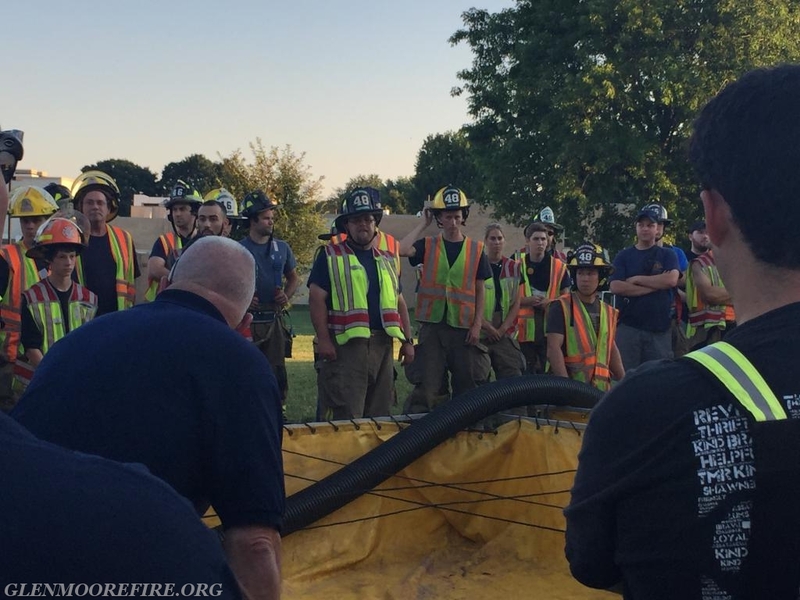 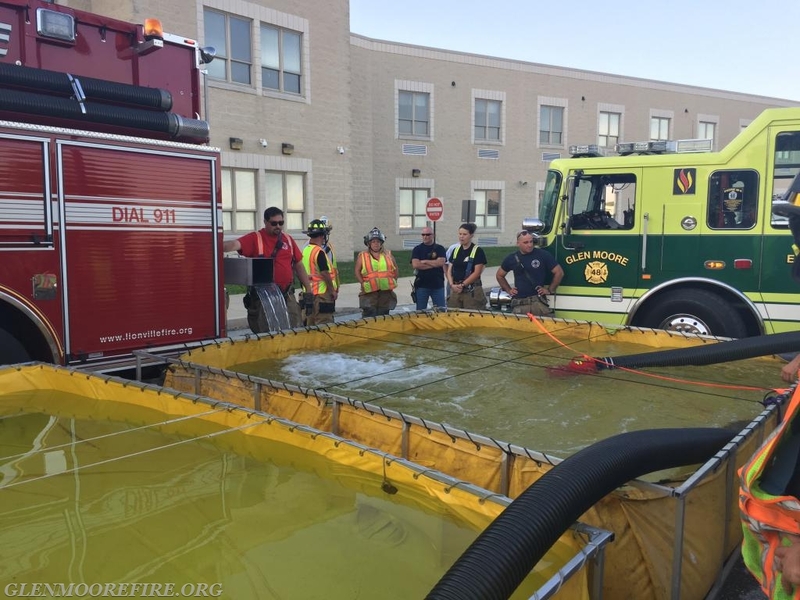 Crews received valuable practice and instruction on setting up the porta-tanks; strainers; and supply lines. 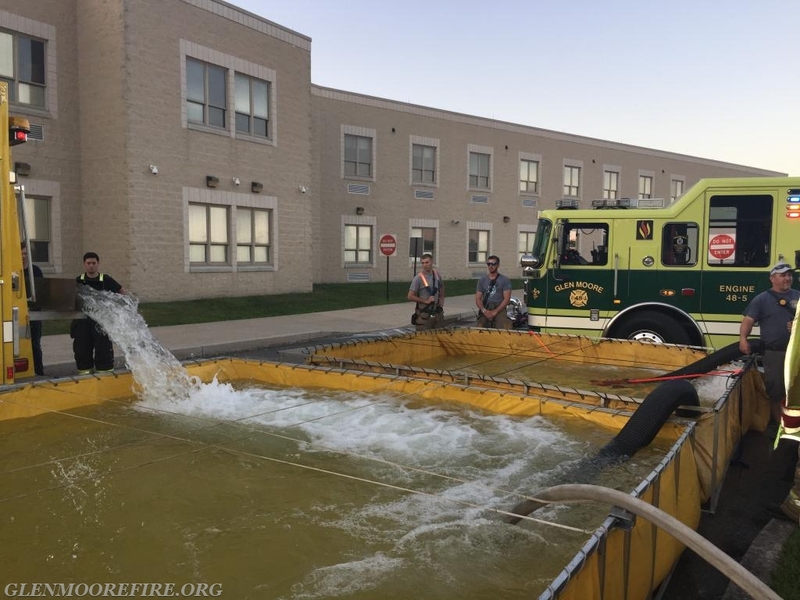 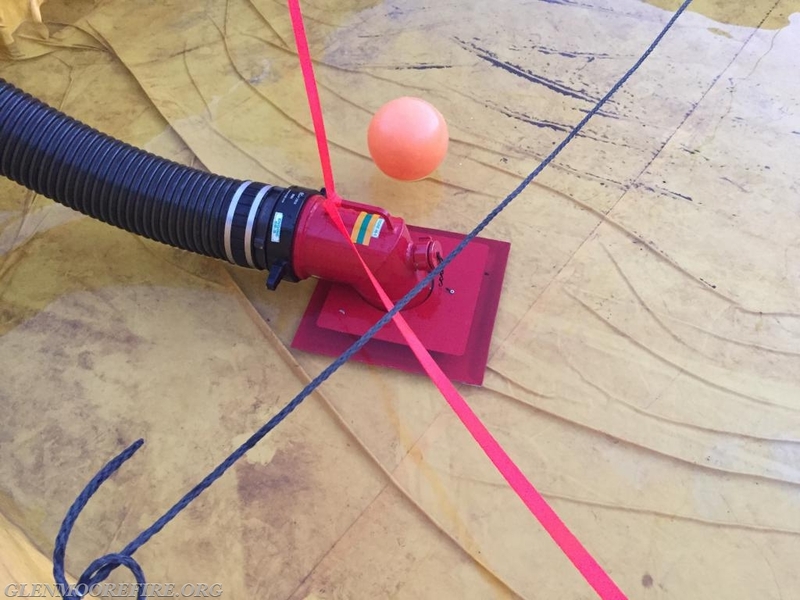 Members were able to observe and understand the amount of planning and organization that is required when implementing a water shuttle operation and how much water is needed to keep the hose lines and master streams flowing. 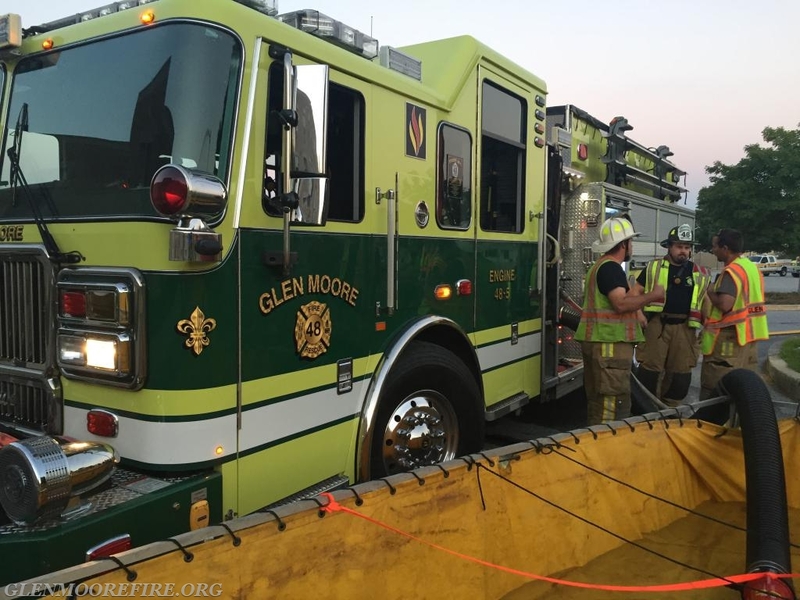 The Glen Moore Fire Company would like to thank the Downingtown Fire Department for this joint training opportunity. 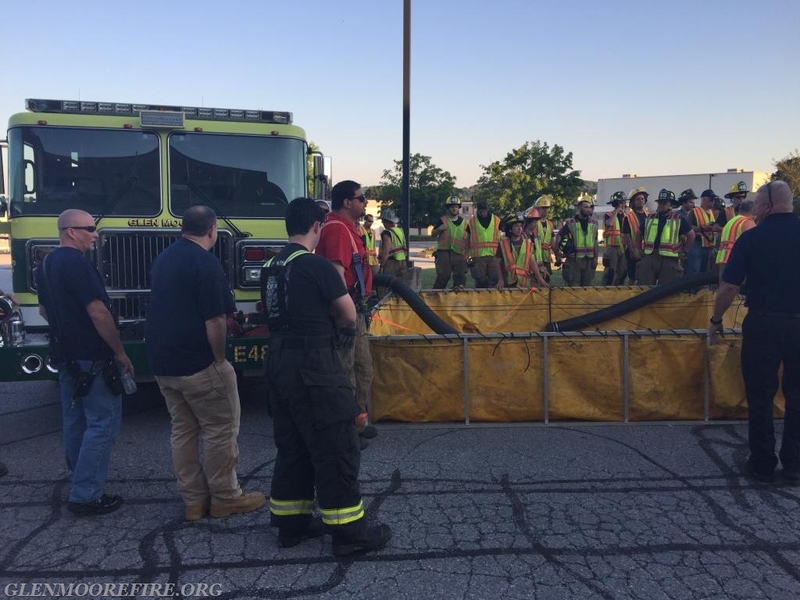 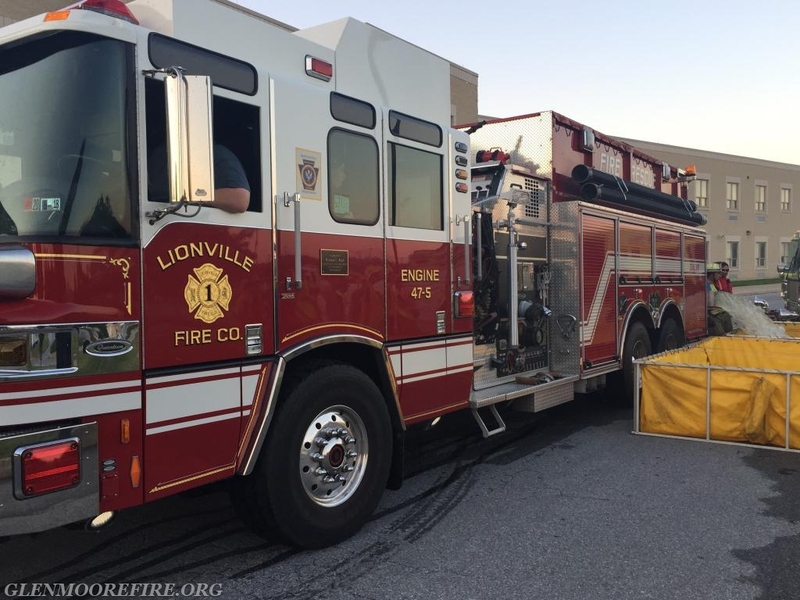 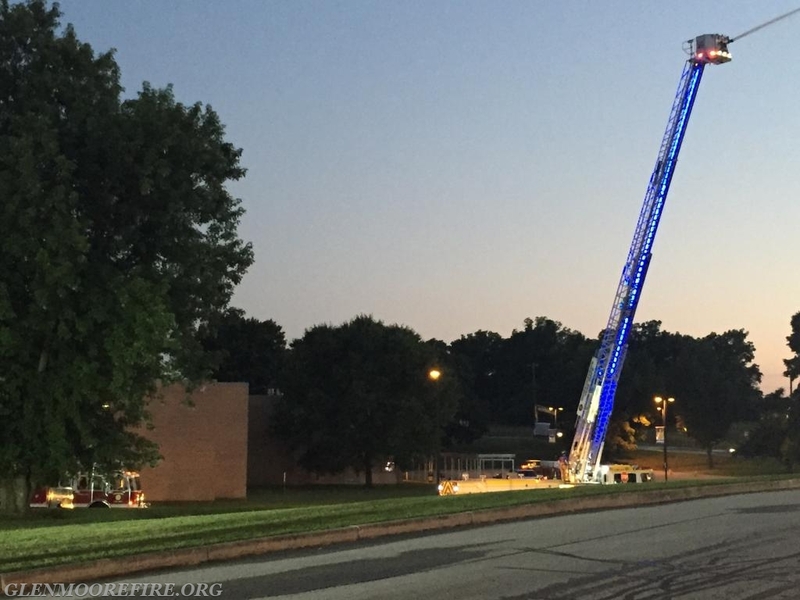 We also wish to thank Lionville Fire Company (47); Ludwig’s Corner Fire Company (73); and East Whiteland Fire Company (5) for providing apparatus and manpower for the training. 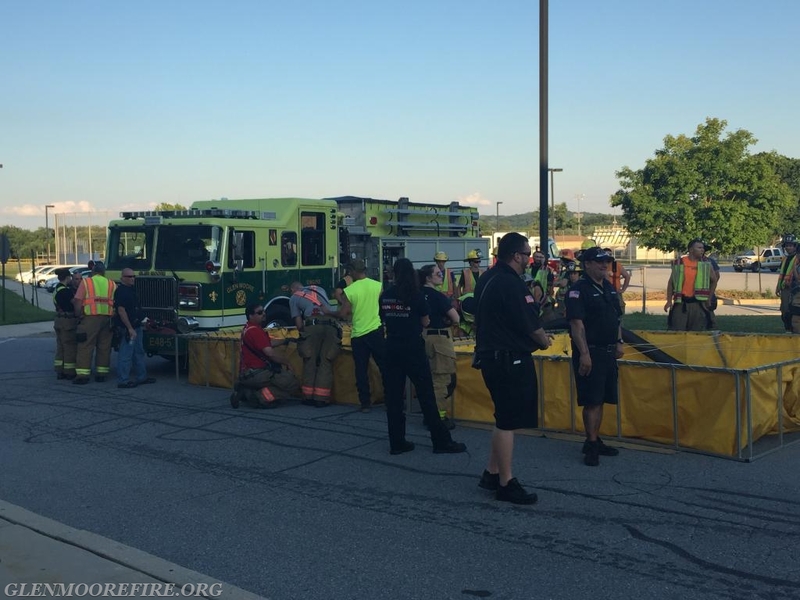 Lastly, a big thank you to the various Fire Police who assisted with traffic control throughout the operation. 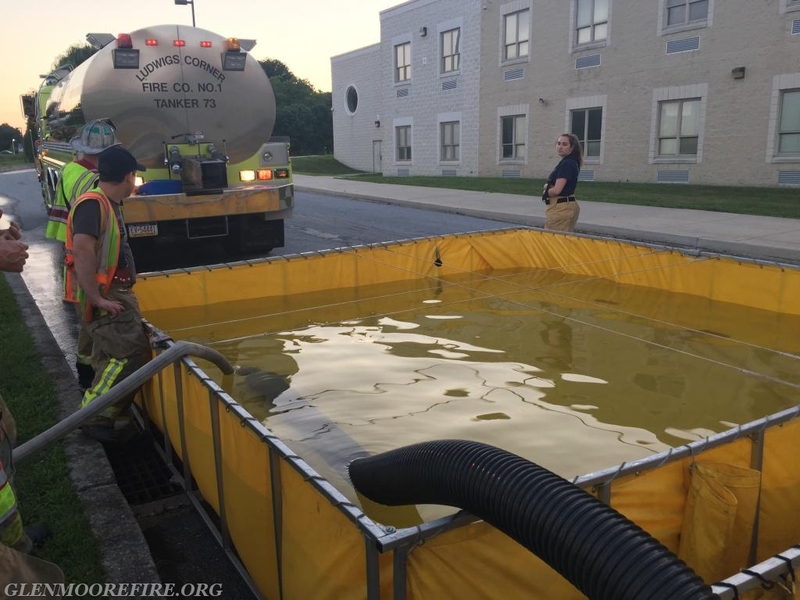 Crews receiving instruction on setting up porta-tanks. 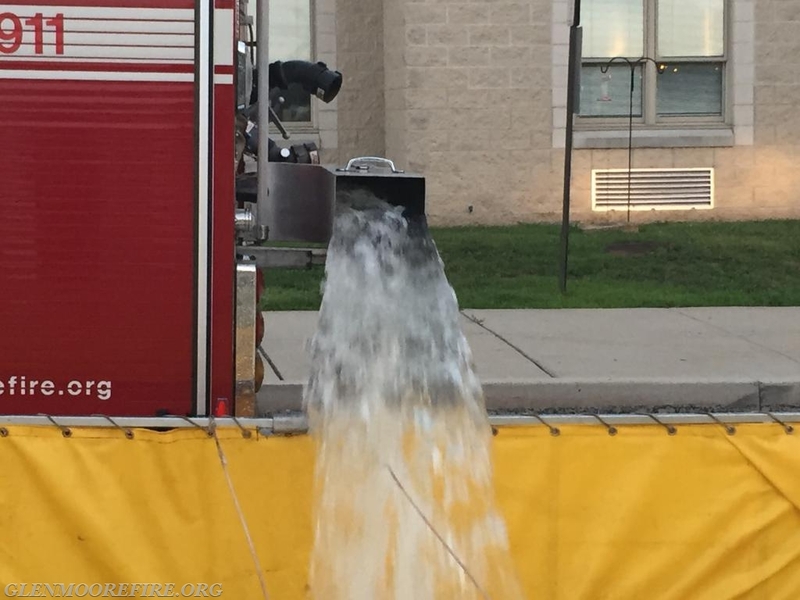 Strainer used to siphon water from the porta-tank to the engine. 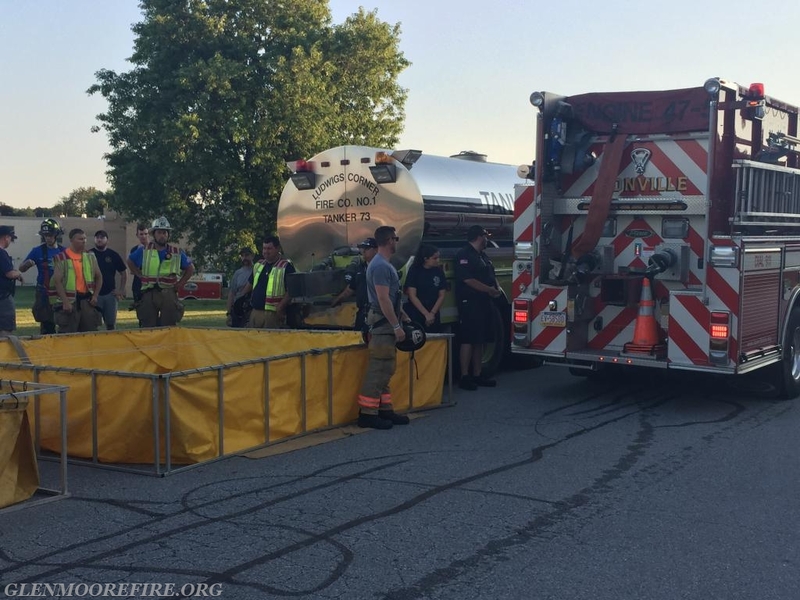 Porta-tanks set up and ready for use. 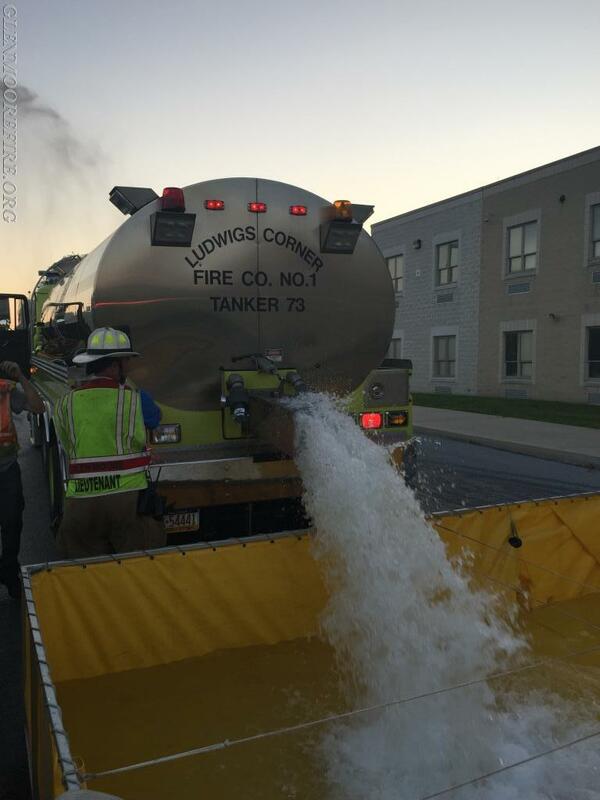 Tanker 73 unloading its water. 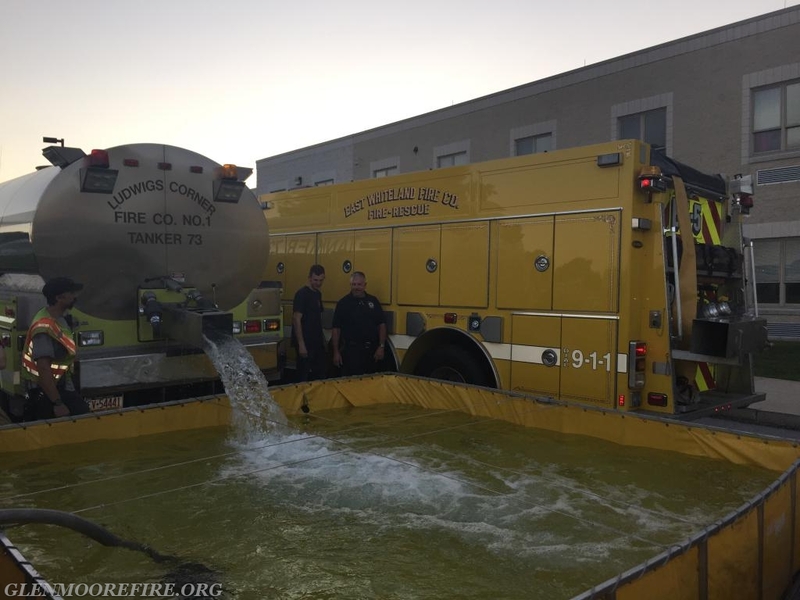 Tanker 73 after filling the porta-tank. 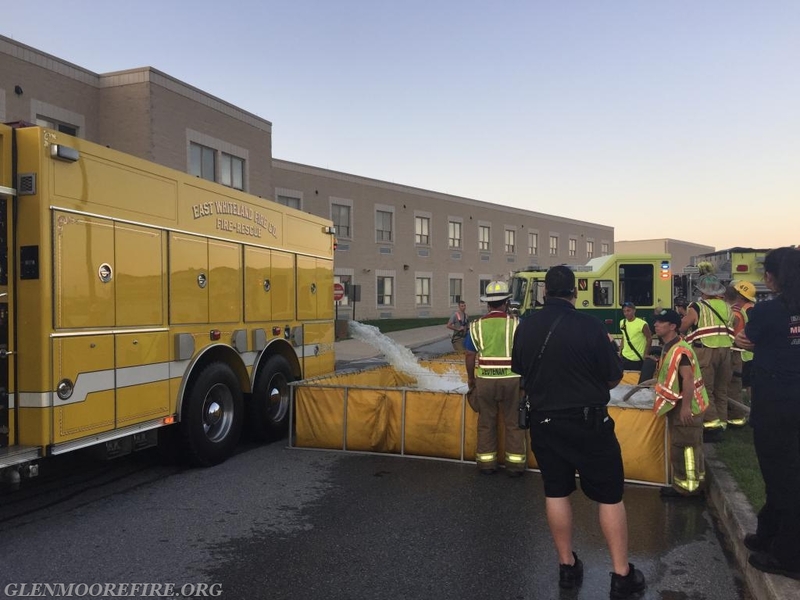 Engine 47-5 unloading its water. 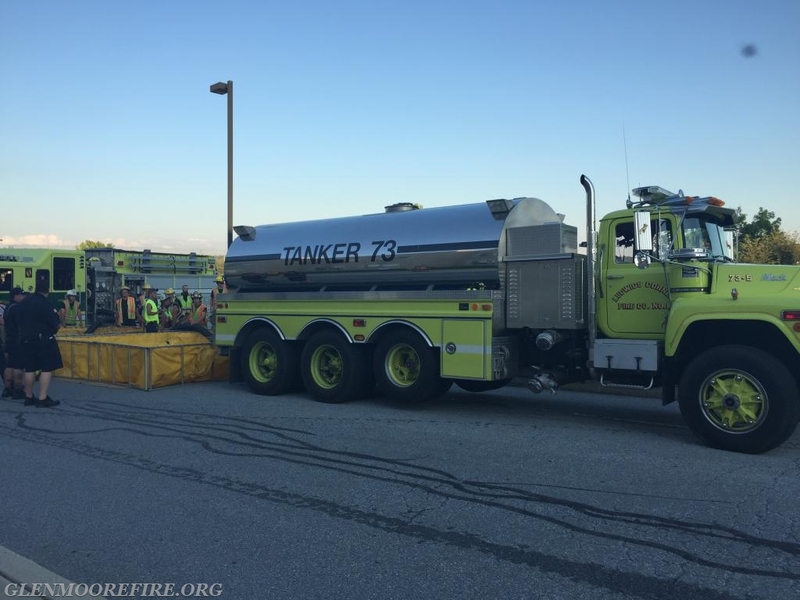 Tanker 73 and Engine 47-5 preparing to unload their water. 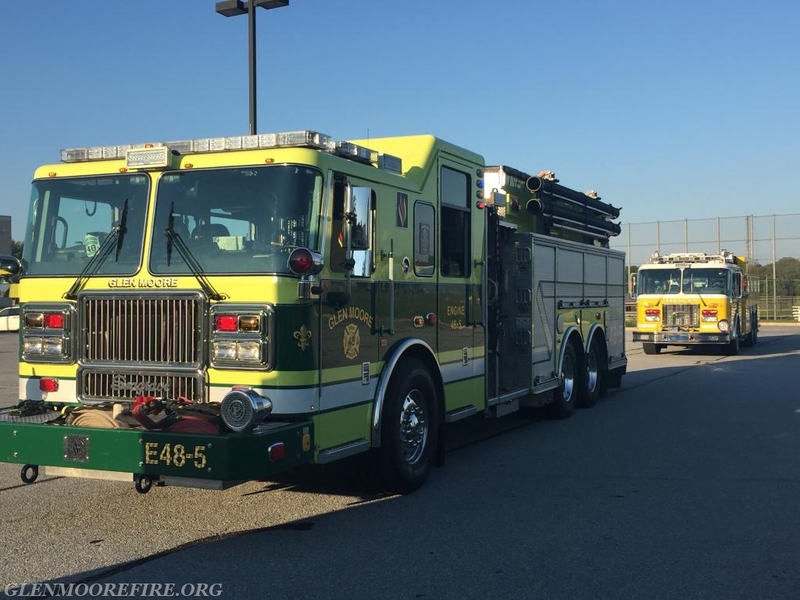 Engine 5-5 with their water chute ready to go. 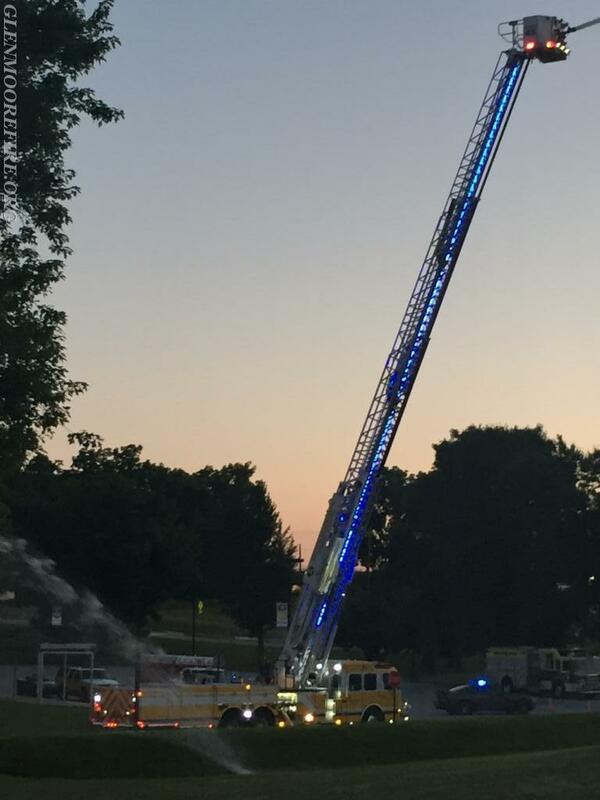 Water flowing from Engine 5-5. 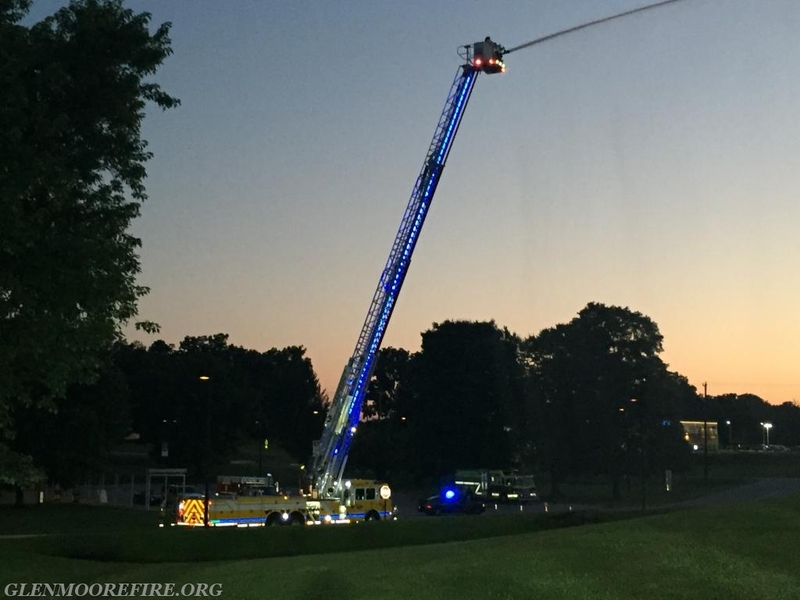 Tower 45 all lit up. 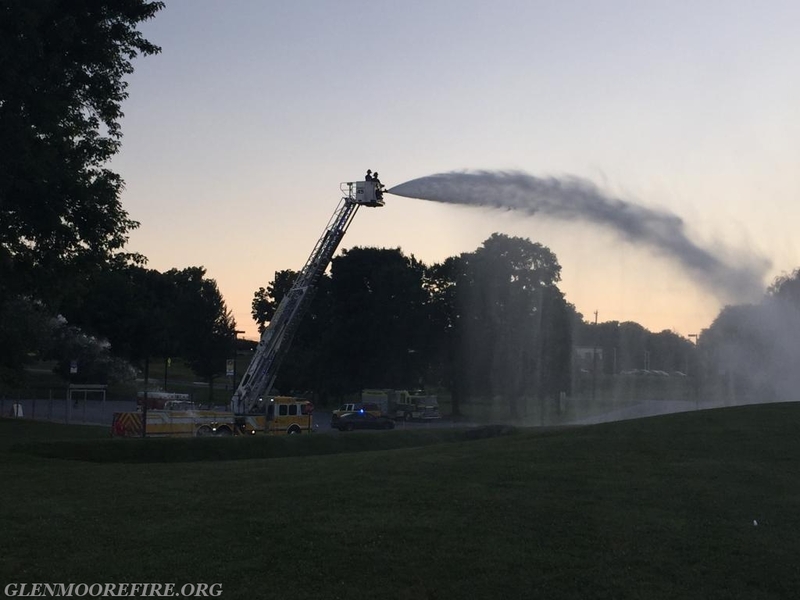 Engine 48-5 pump operators supplying the water.